This is a set of 25 slides of botanical material prepared by probably the last UK slide preparation company - ESP in Sussex. The material was designed to cover the various botanical classification features that apply to botany and includes primitive plant forms such as ferns and liverworts to the more complex structures such as sunflower, bean and pine. All slides are different. Good value and good quality. This is a set of 12 sections of frog and rat tissues slides stained by haematoxylin and eosin. Made by the late Eric Marson of Northern Biological Supplies (NBS) who has become somewhat of a legend in the technology of slide preparation - and rightly so. From the style of the labels they would seem to date from the 1980’s. A collectors set. Developed by the late Eric Marson of Northern Biological Supplies (NBS), this is an ingenious system to see the effect of polarising microscopy. The Polarspex is a pair of polarising filters that crossed in a holder that has a slot for a microscope slide to be inserted. This can then be examined with the x4 or x10 objectives of any biological microscope. The holder is supplied with 7 slides that show the effect of polarisation. This is a set of 12 sections of fungi slides stained by haematoxylin and eosin. Made by the late Eric Marson of Northern Biological Supplies (NBS) who has become somewhat of a legend in the technology of slide preparation - and rightly so. From the style of the labels they would seem to date from the 1980’s. A collectors set. epithelium (skin), columnar (intestine) and ciliated (bronchus), adipose tissue (fat), areolar tissue (soft tissue under the skin) and white fibrous tissue (tendons). Original prepared by ESP Ltd Sussex. A set of nine slide preparations from the darker side of live! Well prepared and presented the slides include liver fluke (whole mount), mites, bed bug (male and female), fleas (male and female), mosquito, leech, mosquito larva and head louse. Not for the faint hearted! An amazing set of 6 slides (photograph shows 8 slides from a prvios collection that had 2 more) that have been produced with great technical skill which has required some of the slides to have a build up of mountant to contain the depth of specimen. Others have been ringed as appropriate. Each slide shows the complete chicken foetus at the following stages of early development. 12-24 hours, 30 hours, 33 hours, 36 hours, 40 hours, 66 hours. We have not seen such a series before. A set of aluminium ring slides of sand from various parts of the world including the Sea of Galilee, La Pash Beach, Ocean City Maryland, Algodonis Dune California, Columbia Mexico, Virginia, New Jersey, Caithness, Swanage, River Morar Scotland and Florida. Each labelled and the set is in a presentation slide box. A set of six slides from the ‘boys’ and the ‘girls’ that shows how it all works. Stained by haematoxylin and eosin and originally prepared by ESP Ltd Sussex. 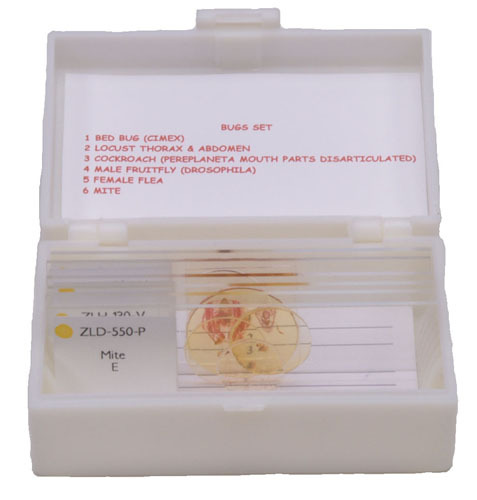 The set includes; ovary with the follicles showing eggs, the fallopian tube, the uterus (womb), testis showing the sperm production, and the prostate. In addition a section of human placenta. A well presented set of hair from a wide variety of animals including camel, horse (its name included! ), mohair, cat, bush possum, sheep, emu feather, chinchilla, pine martin and red deer. The microscopic difference between these species is quite striking and cross polarising filters show amazing detail. Each slide has a circular coverslip which has been expertly ringed with red and white sealant. A set of well prepared dry mounts from a variety of specimen types consisting of sand from the Sahara, foraminifera from Dog’s Bay, cuttlefish, sand from India, sand from Bingley Yorkshire and three preparations of opal. All are ringed and labelled. A nice set. 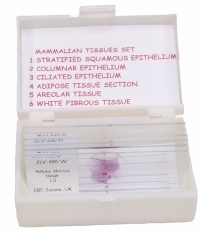 A set of six slides from mammal tissues that have been expertly stained with haematoxylin and Eosin. Originally prepared by ESP Ltd in Sussex. The material consists of cerebellum, medulla oblongata (hind brain), salivary gland, oesophagus, thyroid and transitional epithelium from the bladder. Complete with presentation slide box. A set of mixed diatom slides some Edwardian and some later together with one polycystina slide from Hayti. This is a set of 27 excellently presented dry mounts of sand from literally all over the world. Each has a circular coverslip that has been ringed often in two colours and the sand is fixed on a black background. The sands are from both marine and freshwater sources including Hong Kong, Australia, New Zealand, Italy, Ireland, The Falklands and the Lochs, Islands and Beaches of Scotland. 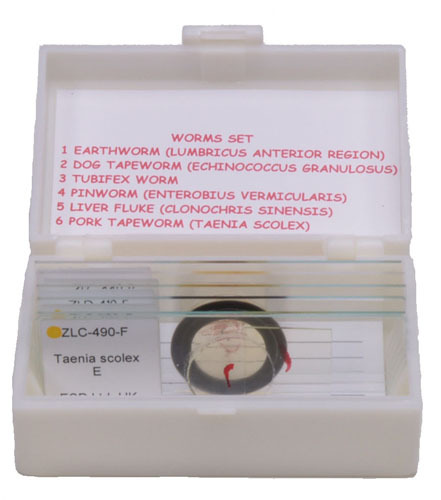 Not the most loved of the worlds creatures, this is a set of six slides of worms that live in very different environments. Stained to show the salient features. 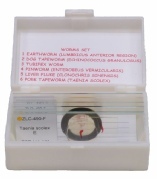 The set includes the garden earthworm (section), part of a dog tapeworm, tubifex worms (also known by the delightful names of sludge or sewage worms - so guess where they live! ), pin worm (also known as thread worm), liver fluke and pork tapeworm. Not for the faint hearted! Originally prepared by ESP Ltd Sussex. This is a set of six slides of bugs - up close and personal! The slides include the dreaded bed bug, parts of the chest and abdomen of the locust (stained), cockroach mouthparts - a complicated set of gnashers!, fruit fly, female flea and a mite. Presentation slide box included. Originally prepared by ESP Ltd Sussex. This is a set of six slides frog (Rana) spawn and tadpole appropriately stained. Originally prepared by ESP Ltd Sussex there are four slides of the developing frog spawn at different stages before the tadpole emerges and then two slides of tadpole from the heart and eye regions. Presentation slide box included. This is a set of 50 slides of sand collected from around the world. The slides have been made using aluminium ring slides and the sand is loose within this capsule with a circular coverslip mounted. The sources are too many to list but include for example Dauphin Island, Florida, Puerto Rico, Japan, Tel Aviv, Seychelles etc etc. All 50 are from different locations and have printed labels. Included is the 50 position slide box. 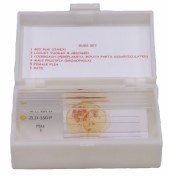 This is a set of well made slides showing the full range of biology including plant life, insects, mammal tissues and pond life. All have been stained as appropriate for the specimen type and are labelled. Complete in presentation slide box.